The problem of how to create social spaces in public places is a well-known one, and there’s lots of attempts at regeneration that fail to make public spaces work. At a recent workshop in Stoke, artists tried to wrestle with this problem. Sarah Nadin was one of half-a-dozen artists I worked with, and her solution was #chumbrella. Perhaps best known for her sculpture remembering Stoke’s connections with Lidice, which she produced as half of Dashyline, #chumbrella is a more light, agile and nimble approach to creating art in public places. Inspired by the act of sharing an umbrella with a stranger the day before, Sarah imagined a place where a distinctive hashtagged umbrella was a sign that the person was willing to share it with a stranger. During the workshop, Sarah created a black-and-white prototype and took to the streets. It started conversations and got people’s interest. So when I was looking at my own London Road project in Stoke, I could see a natural fit. London Road is one and a half miles long, but – and despite being plentiful in parks, gardens and green spaces – it’s not a very social place. People in shops stop and talk, but the street is all about bustle as you’d expect on the main road in and out of the city. 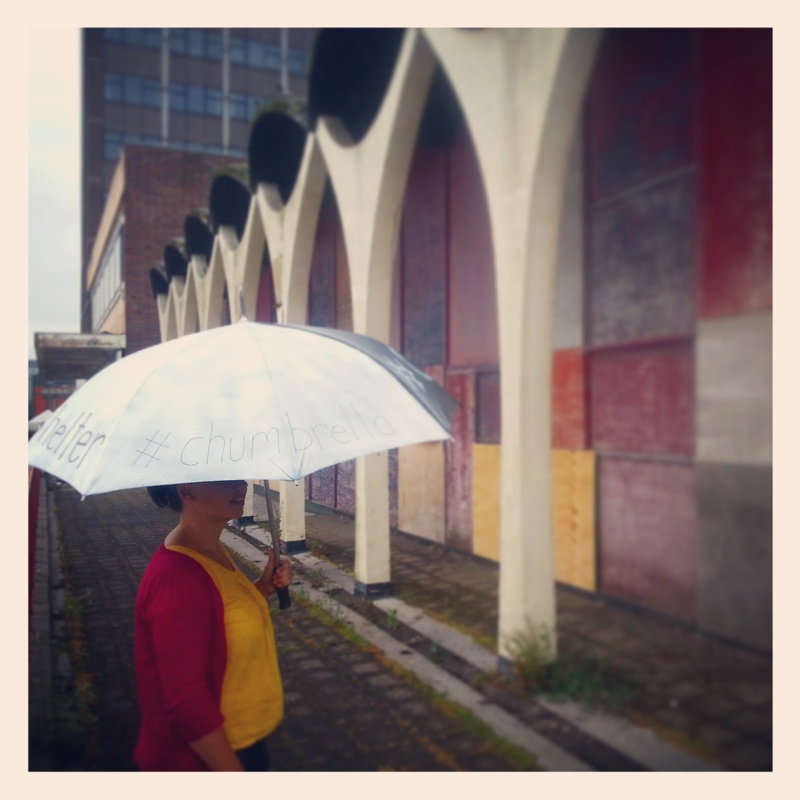 So as part of the London Road project, with funding from Appetite, I asked Sarah to move #chumbrella from prototype into production. She created a yellow and white design, the umbrella split in half rather than the more conventional segments, and had a first batch manufactured. It’s a move from big sculpture to being a social artist, so I feel like the investment is in the artist as much as the artwork. And if this idea spreads, she’ll be creating literal pop up social spaces in streets across the country. 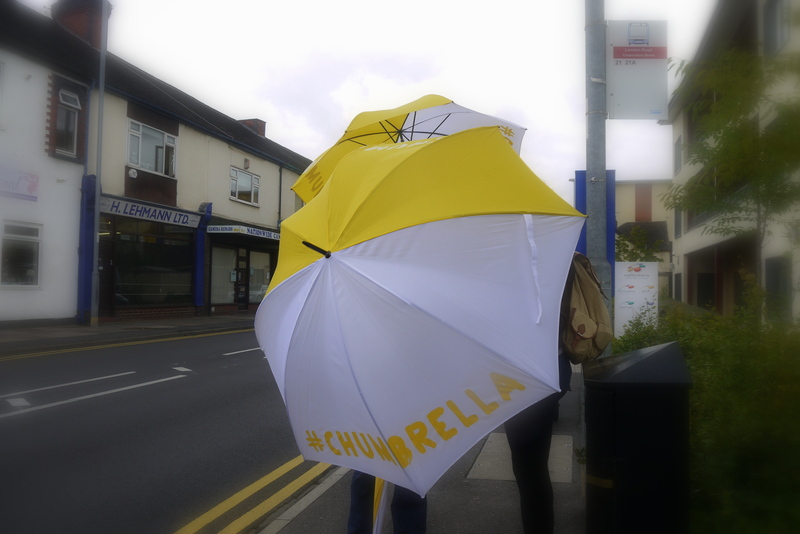 The first public outing for #chumbrella was a walk along London Road. Half a dozen artists agreed to be the first to carry #chumbrella, and they started a dozen conversations, as well as making lots of people smile as they walked from Campbell Place to The Boulevard and back again. #chumbrella will be back on London Road in September, and I’ll be carrying one as a useful tool in my work there. But the aim is also to see how far it can be rolled out, creating a simple How To guide and distributing the first batch of #chumbrellas to people around the country who can use them. Open source, freely available public art? The medium is, as they say, the message.